Internationally bestselling Kiwi crime writer Paul Cleave is featured in the latest episode of Bookends TV, which is "a vibrant and dynamic conversation about contemporary books and the world of literary genre" produced in Canada. In the latest episode, "Serial Killer Thrillers", award-winning journalist and TV host Justine Lewkowicz interviews Canadian crime writer Jennifer Hillier about her lifelong fascination with serial killers, and her latest book FREAK, and visits Toronto mystery bookstore The Sleuth of Baker Street to get three recommendations for top notch serial killer thrillers from co-owner JD Singh. The widely-read Singh highlights Mo Hayder's GONE, Val McDermid's A PLACE OF EXECUTION, and Cleave's debut THE CLEANER, as excellent examples of the genre. 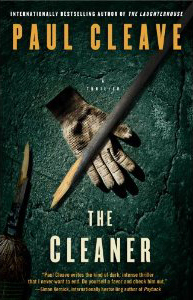 For Singh, who is looking for more than just a high body count or visceral thrills, the things that appeal in the best serial killer thrillers include "the quality of the writing, perhaps a good sense of humour, the location, maybe..."
THE CLEANER will become available in North America later this year (US cover pictured left - Lewkowicz is actually holding a copy of Cleave's fifth novel, and second to be released in the US, COLLECTING COOPER, in the online TV episode while Singh talks about THE CLEANER). Singh says that he has only recently been introduced to Cleave but THE CLEANER, which focuses on Joe, a relatively non-descript man who pretends to be mentally challenged in order to work at the police station, while leading a double life as a serial killer, "was terrific" and that he "can't wait for copies to become available" in North America. THE CLEANER has been acclaimed and hugely popular in many overseas countries, so it's great to see a positive early response in North America as well. Cleave, who won the 2011 Ngaio Marsh Award for his fourth novel BLOOD MEN, and recently won the Best Thriller Award at the 'Pocket Book Fair' in Saint Maur des Fosses, France for the French version of THE CLEANER (UN EMPLOYE MODELE), is currently putting the finishing touches on his seventh novel, which sees the return of Joe. Exciting. Have you read THE CLEANER, or the Hayder and McDermid novels JD Singh highlights as great examples of the darker, serial killer thriller part of the crime fiction genre? Do you like well-written tales of the darker side? Comments welcome.